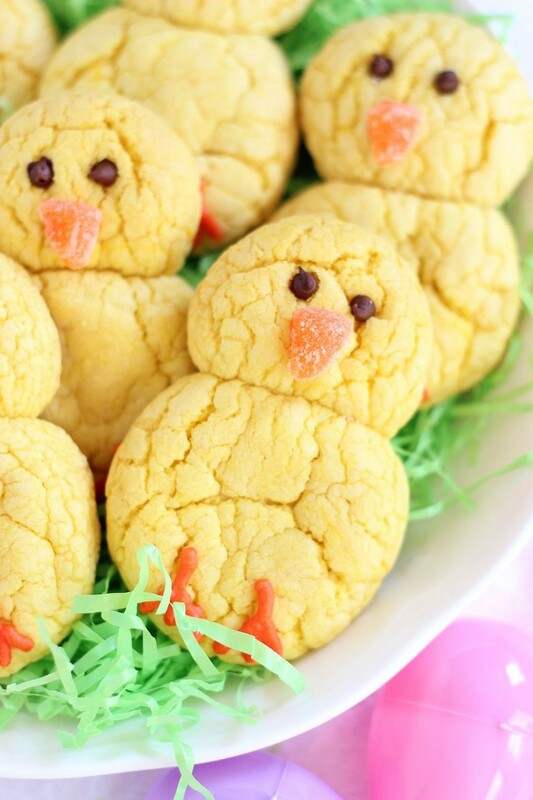 Simple lemon cake mix cookies decorated to look like Easter chicks. These Easter Chicks Lemon Cookies are ridiculously easy and quick to make! 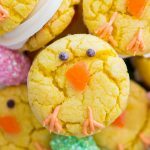 These adorable Easter Chicks Lemon Cookies are so fun to make with kids or as a family activity for springtime! 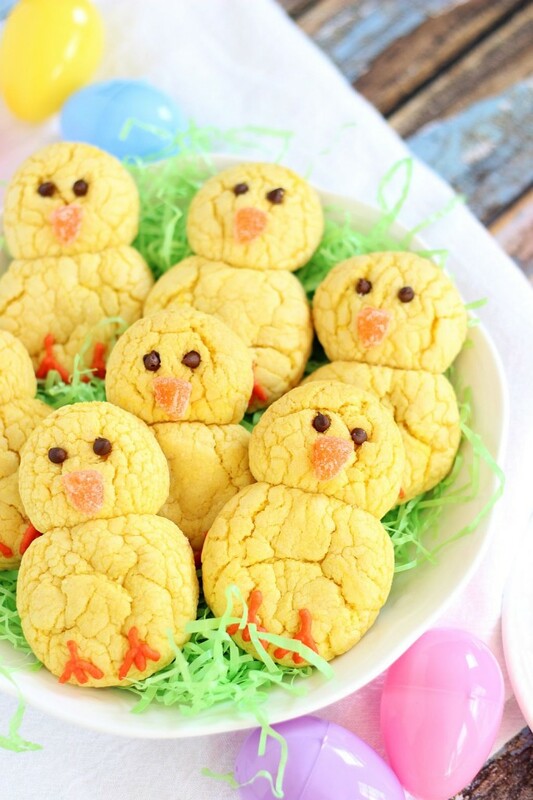 These Easter Chicks Lemon Cookies don’t technically contain any real citrus, so it’s sort of cheating to include them in Citrus Week, buuuuut, they are lemon-flavored cookies, so they kinda count, right? Tell me you love cake mix cookies. We love them in my family, and I love their versatility, and I love how soft and chewy they are. You can do so many things with cake mix cookies! I realized today that Easter is only about a week away. How do the holidays sneak up on us so fast?? And when you’re always thinking at least 1-2 holidays ahead of things (you know, to bake stuff and make stuff), then it feels like time is flying even faster. I’ve been brainstorming a little bit for the 4th of July, so my brain is on summer ideas. Yet, I’m still astounded that Easter is nearly here. How is it almost Easter already? April is also upon us? Wasn’t Christmas like two weeks ago? 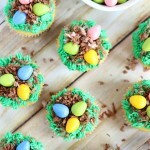 All that said, it occurred to me that if I have any recipes that are pretty specific to Easter, like these Bird’s Nest Cupcakes (they’re soooo cute!) or this Bird’s Nest Chocolate Chip Cookie Cake (super soft & chewy cookie with classic buttercream) I needed to share them quite soon. 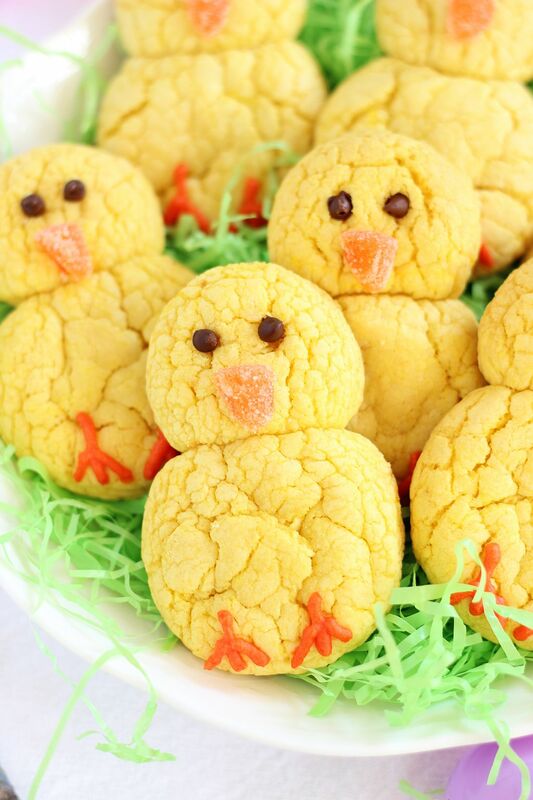 I think we can all agree that cookies shaped like little chicks are very much Easter cookies. 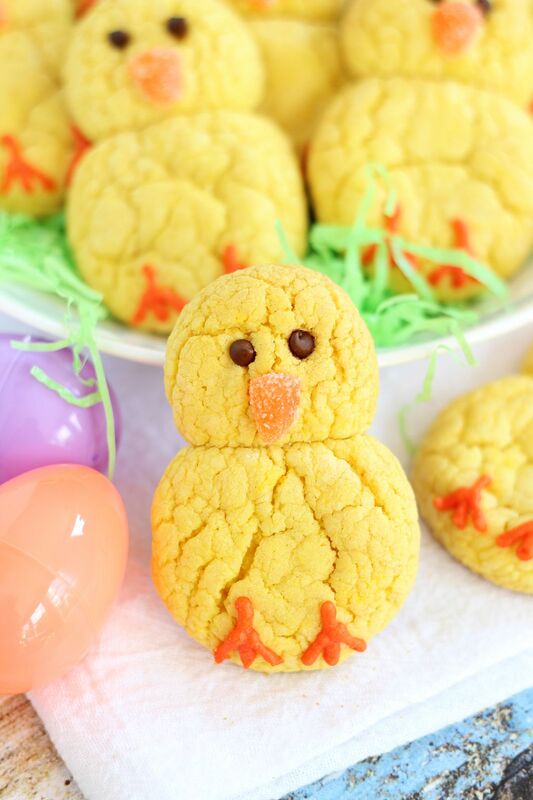 While these Easter Chicks Lemon Cookies would be cute other times of the year, they’re not nearly as fitting as they would be right now. I want to give you plenty of time to plan to make these cookies, even though they barely take any time at all to throw together. Cake mix cookies always stay really soft and chewy too. My Gma created her own version of Oreos using chocolate cake mix cookies and a marshmallow frosting sandwiched in between. They’re amazing. 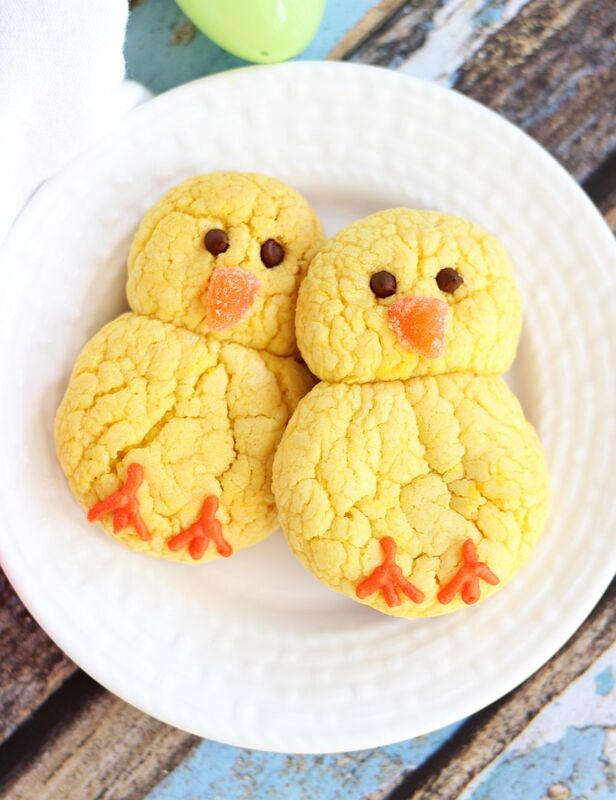 I can always go for good lemon cookies (or lemon anything), and I saw a similar Easter Chicks Lemon Cookies recipe from Pillsbury, and thought they’d be so fun to make for Easter. They’re adorable and they were so simple to make. Because they’re a cake mix cookie and lemon-flavored, I knew we’d also love how they taste. Cute + delicious. Look at ’em.. they are seriously perfect for the holiday! 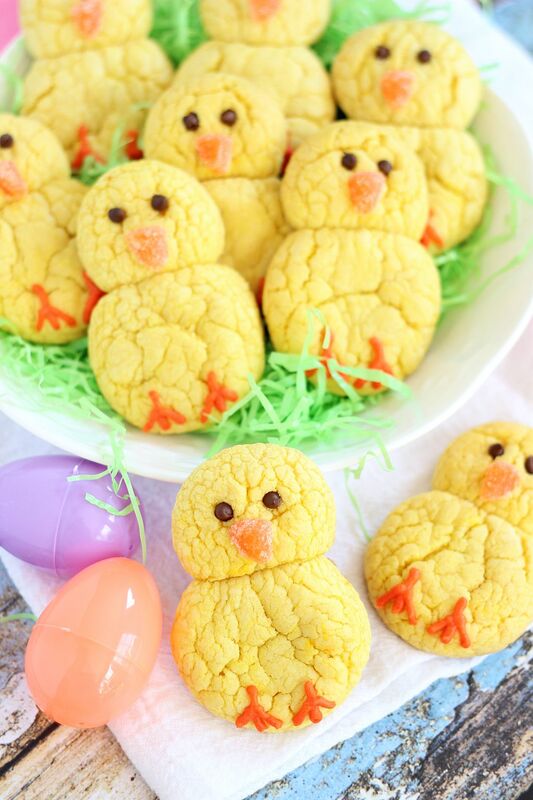 If you’re looking for other Easter cookies or Easter recipes, also check out these Easter Chick Cookies… they’re similar, but a sandwich cookie with frosting in-between! Also, these Amish Sugar Cookies are THE BEST sugar cookies of all time. Soft, puffy, melt-in-your-mouth delicious, and they’re unbelievably easy. Since these are really quite simple to make and to decorate, I think these would be a super fun cookie to make with kids too. If you’ve got little ones at home, this would be a really fun kitchen project! Oh my gosh, Sarah! These are SO cute! My lemon-loving 3-year-old just asked me last week when we could make cookies. I was thinking we’d make some bunny-shaped sugar cookies in the next few days, but I may have to change our plans. He would LOVE the lemon flavor of these little guys, and they’re perfectly adorable for Easter. So clever! 🙂 Oh, and a bonus that they’re made with a cake mix. When cooking with kids, it better be quick and EASY! These are ridiculously cute cookies!!! Love these! You are so creative — I’m jealous! these are so so cute Sarah! haha I love the beak! I feel the same way, how is it Easter already? I didn’t really make anything festive this year either. Love these lemon cookies! They are super cute and can imagine so fun to make! Yummy!! I love lemon cookies! I will try to make this for Good Friday. By the way, I really enjoy reading your blog since I receive your emails. Thank you for sharing! Oh that’s awesome! Thanks, Joyce! So glad you subscribe. Aren’t they cute cookies??? 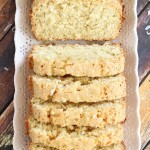 They taste so good and lemon-y too! I cannot believe how fast time is flying by! So crazy! These are just about the cutest cookies ever, Sarah! I love your creativity! They look so delicious, too! I know! It’s almost Easter – I can’t even believe it. Feels like it was *just* Christmas. Thanks, Gayle! These have to be the cutest cookies ever. Those tiny little feet are to die for. So cute!! Hoe creative Sarah! 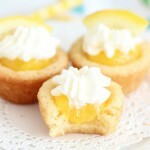 My daughter would love these and I love lemon to its a win win!! Pinned! 🙂 And yes Christmas was just 2 weeks away. Crazy time.. I feel like these would be super fun to make with kids! You should make them with you daughter before Easter! They come together so quickly and easily. 🙂 Thanks, Cyndi!! Oh my goodness, I am in love with how adorable these are! Can Easter get any cuter?! These are a total win! Aren’t they cute? They were super fun to make! Thanks so much, Michelle!! OMG! “tweet tweet” these are just ADORABLE! thanks for sharing them with us! Lol!! I love the “tweet.” Haha!! Thanks so much, Kelsey! Haha!! You should do it!! They’re so easy and fun, and they turned out pretty cute! Thanks, Lorraine!! This chicks are adorable 🙂 It would be great to contain real fruit but I’m sure that are very delish this way too. Should have I used butter for the shortening? I used oil and it make a huge mess. Thanks! Yes, shortening. The recipe calls for shortening, and it is listed in the ingredients as such! I hope you were able to remake them successfully! Happy Easter! Shortening…. do you mean butter? Crisco! There are probably cake mix cookie recipes that use butter though if you don’t have Crisco! These are a great Easter Party idea! Thanks for linking this post to #PureBlogLove link party. These look so adorable. 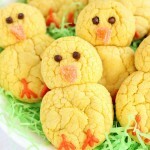 These cookies would brighten any Easter get together. Thanks for sharing over at the Snickerdoodle Sunday. Those are adorable. Bet they didn’t last long! What a sweet cookie idea! Those little chicks are absolutely adorable. I love how you decorated them with the little chocolate chips and gummy beaks. Glad to know that you added those decorations after the cookies were baked. Did it help the cookies to cool more to keep the chocolate from melting or didn’t it matter? Thanks for the help and I can’t wait to try. These are so cute! Gotta give these a go for Easter! 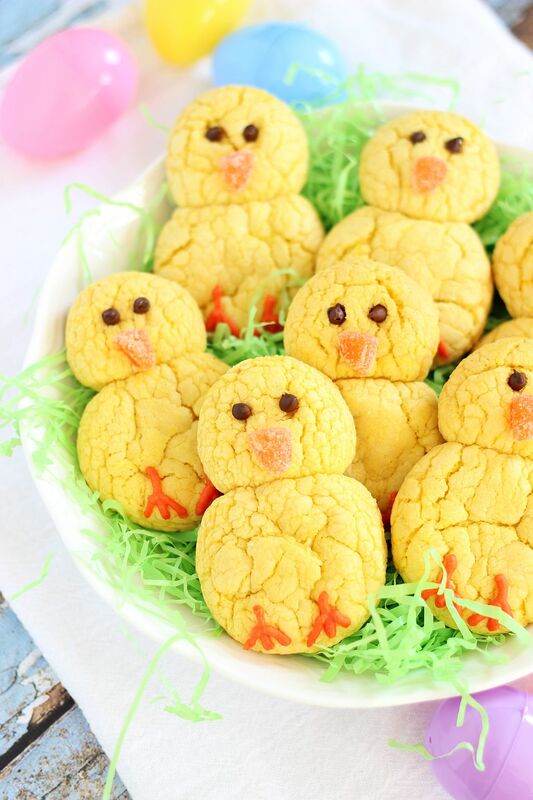 These Easter Chick cookies are just adorable. I love that they are made from a cake mix, too. Thanks for sharing at Snickerdoodle Sunday. This is my Snickerdoodle Special Feature of the Week at tomorrow’s party. Don’t they though? Thanks, Gloria! These are SO cute! Perfect for any time of the year because we have a “Chicky” in the house. These are really adorable! I definitely need to put them on the list of Easter goodies that I want to make! Pinning! All I can say is perfect and adorable! I’ll take a dozen, please~ lol~ Thanks for bringing this by to Throwback Thursday!! Voted this as my favorite on last week’s party and now it’s been voted Best of the Best. I just made these and I am in love! 🙂 I tweaked it a little by using a Funfetti cake mix because I wasn’t sure if everyone would like the lemon. I can’t wait to show these off tomorrow at Easter dinner! Funfetti sounds adorable!! I love that idea. It might be fun to do a bunch of these in all different pastel colors too! Have to admit I made the cake batter by the box before I realized that wasn’t the recipe! We are the cake anyway and started over! I also used Reese’s pieces for the beak, which worked out very well! Thank you for sharing. These are perfect for my son’s 4th grade class party. (I left off the beaks for those kids that can’t have peanuts.) So easy! Oh no!!! I wonder if I should make a note on the recipe so people don’t throw together the cake mix the way the package states. Ooops!!! I’m so glad that you got a cake out of it too though. Haha. Reese’s beaks are a GREAT idea. Thanks for sharing. So happy you liked them. 🙂 Happy Easter!! What cute cookies! My kids would LOVE them! Aren’t they fun?? Thank you! Made these for Easter last year. Doing again this year. Absolutely adorable, and soooooo good. Family loved them! Oh yay!!! So glad you guys liked them. Aren’t they fun? We are making them too! Happy Easter! My kid said would love these! They are sooooo fun!! Happy Easter, Nancy! Hi! I love the cookies. I only have one question. What should be the mixture if we don’t have a ready cake mix. I live in Bulgaria, and we don’t have such mixtures. I would love to prepare them with my kids. Hi! That’s a great question. I’m sorry that cake mixes aren’t more readily available – I’m glad you told me so that I can try to accommodate other readers with a similar issue! I’ve found that you can make a homemade cake mix: https://www.lifeloveandsugar.com/2017/02/24/homemade-vanilla-cake-mix/.Y You could try that! Instead of preparing the homemade cake mix as a cake though, you’d make the cookies with it using my recipe. The homemade cake mix would just be the base. Does that make sense? Otherwise, you could probably use most sugar cookie recipes to make these! The key is just tinting the batter yellow, baking the dough balls near each other so that they attach as they spread in the oven, and then how they are decorated. 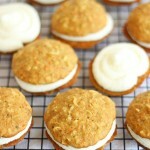 I think many basic sugar cookie recipes would work with similar effect! Good luck. 🙂 Let me know if I can be of further help! They’re so cute. I plan to make them for our family Easter dinner which is on Sunday. If I make them on Friday and keep in an airtight container do you think they’ll still be fresh tasting on Sunday? Or should I just do them on Saturday? I’ve got a very large family and so much prep work to do before everyone arrives, si I’m trying to do as much in advance as I can. Thanks for the great idea and your help. Hi!! I do think that cake mix cookies don’t stay as soft after the first two days or so, so if you are at all able to wait til Saturday, I think they’d be a teeny bit more fresh. That said, they’ll be TOTALLY fine to make today, and they’ll still taste good on Sunday! They might just be slightly less soft! I would do whatever minimizes stress for you. Haha. 🙂 Happy Easter!! Thanks Sara. I made them on Saturday and everyone loved them. My orange icing turned out to be more peach but they still looked good.